Now you can get a unique Batman Birthday Candle. This candle is hand made for you and is actually a candle holder with a white candle on top. You can pick the candle holder as it comes in the number 1 – 9 and the full alphabet. 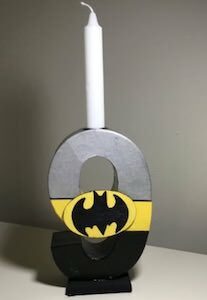 And the candle holder is black on the bottom and gray on the top and in between there is a yellow band with the Batman logo on it. And true Batman fans know what they see as it looks like Batman outfit complete with the yellow utility belt. So now found the candle for your own or maybe your child’s Batman birthday party.